RAISE UR PAW NEWS: JULY 20th 2017 - SAVE THE SEALS CAMPAIGN - JOIN TODAY! 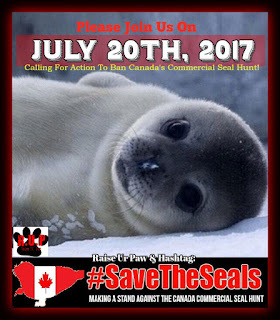 JULY 20th 2017 - SAVE THE SEALS CAMPAIGN - JOIN TODAY! We at RAISE UR PAW, a Canadian Federally Incorporated Not-For-Profit are truly hoping to unite individuals and organizations for an international effort to ban the Commercial Seal Hunt within Canada through #SaveTheSeals. Our Campaign is directed towards the Government of Canada & Canadian Political Officials in hopes of urging them to pull their support and funding from this inhumane and cruel hunt. For decades, innocent seal species have been victimized and murdered by sealers and the sealing industry in order to fulfill demands for seal products, even though the market is decreasing at a considerable rate, and bans for seal products have been set in place by many countries around the globe. But even with the decreasing market, bans, countless rallies and protests & petitions, this vile action against these innocent lives is still going on, supported and funded (tax-payers dollars) by the Canadian Government ... and they still define this dying industry as "Humane". ANIMAL ANGELS WORLDWIDE: SIGN BAN CANADA'S COMMERCIAL SEAL HUNT PETITION TODAY! JOIN OVER 17K Who Have Already Signed In Support!! On July 20th, we are counting on international support in helping us, with much urgency, to have our voices heard by the Canadian Government and Prime Minister Justin Trudeau -- and it is through this support and participation from individuals, like yourselves, that we will come together as one united force in making this goal a reality. We are requesting that each individual & organization to please use the hashtag: #SAVETHESEALS, whether it be through tweets or even adding photos or videos, with the hashtag present (via twitter, facebook, instagram etc) ---- also you can include imperative information that will help educate, encourage and empower others to join the ranks in extending our reach to the ears of the Canadian Government. 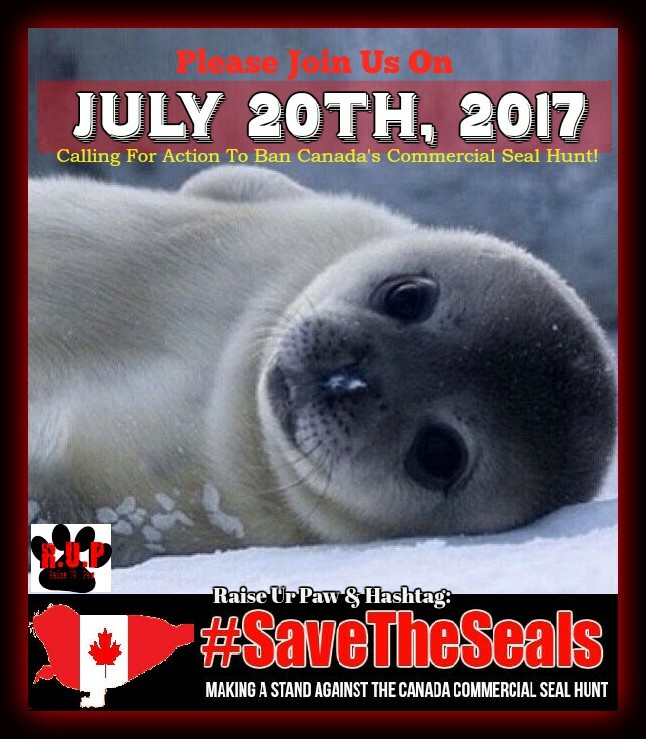 PLEASE SHARE & RAISE UR PAW on JULY 20th, 2017 - WE TRULY HOPE WE CAN COUNT ON YOUR SUPPORT TO HELP #SAVETHESEALS. The brutal slaughter of Canadian Pup Seals is unwarranted unnecessary and man's interference in Nature. Most of the killed Pup Seals are just weeks old, they have never lived a life.